Whoops! Flynn Broke the Law! This has gotta hut those die-hard Chumph defenders! More evidence of why Chaffetz is jumping the rotted, rusty, Chumph scow. More evidence Flynn will be the first to sing! Former national security adviser Michael Flynn likely broke the law by failing to disclose foreign income he earned from Russia and Turkey, the heads of the House Oversight Committee said Tuesday. Committee chairman Jason Chaffetz (R-Utah) and ranking member Elijah Cummings (D-Md.) said they believe Flynn neither received permission nor fully disclosed income he earned for a speaking engagement in Russia and lobbying activities on behalf of Turkey when he applied to reinstate his security clearance, after viewing two classified memos and Flynn’s disclosure form in a private briefing Tuesday morning. “Personally I see no evidence or no data to support the notion that General Flynn complied with the law,” Chaffetz told reporters following the briefing. Nearly three-quarters of Americans say they want an independent, non-partisan commission instead of Congress to investigate Russia’s involvement in the 2016 election, according to the latest NBC News/Wall Street Journal poll. Seventy-three percent of respondents prefer the independent investigation, versus 16 percent who pick Congress. Still, a majority of Americans — 54 percent — believe that Congress should investigate whether there was contact between the Russian government and the Trump campaign, which is essentially unchanged from February’s NBC/WSJ poll. 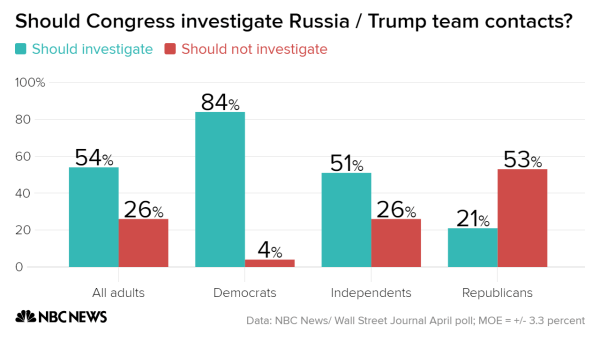 That includes 84 percent of Democrats and 51 percent of independents who want to see this congressional investigation, but just 21 percent of Republican respondents who want it. Yet a combined 61 percent of Americans say they have little to no confidence in Congress conducting a fair and impartial investigation into Russia’s involvement in the 2016 election. Only a combined 39 percent say they have “some” or a “great deal” of confidence in Congress conducting a fair and impartial investigation. These numbers come as committees in both the House and Senate are looking into Russia’s involvement in the 2016 election. But the House investigation erupted in controversy after House Intelligence Committee Devin Nunes, R-Calif., suggested that Trump and his associates may have been monitored by U.S. intelligence officials during the transition. Nunes stepped aside from the investigation earlier this month.